Palisades Laser Eye Center is pleased to announce the release of the new and improved http://www.palisadeslaser.com. 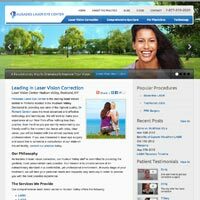 Palisades Laser Eye Center has announced the launch of its new website at http://www.palisadeslaser.com. Led by Dr. Richard Gordon, the laser vision center in Rockland, New York serves the Hudson Valley with LASIK, iLASIK, PRK, and other laser eye surgeries. Dr. Gordon is noted for using such advanced techniques and technologies in his practice as IntraLaseâ bladeless LASIK surgery, the VISX STAR S4â excimer laser, CustomVueä WaveScanâ technology, and the Orbscanâ II diagnostic system. Patient comfort, safety, and satisfaction are the primary objectives of Dr. Richard Gordon’s practice. Dr. Gordon expands upon his extensive experience and training by participating in continuing education courses and continually seeking new and more effective ways to serve his patients in the Rockland and Hudson Valley region. In addition to state-of-the-art laser surgeries, Dr. Gordon’s laser vision center offers a comprehensive range of treatments for eye disorders, including cataracts, glaucoma, presbyopia, and keratoconus. Dr. Gordon has performed thousands of vision correction procedures during his career, and Palisades Laser Eye Center has a reputation for producing consistently excellent results. The practice’s new website features detailed information about the technology used to treat patients, the procedures performed by Dr. Gordon, and the history of Palisades Laser Eye Surgery. In addition, visitors to the website can watch videos of actual patients discussing their experiences at Palisades Laser Eye Surgery and read Dr. Gordon’s blog for the latest news in eye care. The purpose behind building this new website was to give people who suffer from poor vision or serious eye diseases a better opportunity to discover the practice and find the information that they are looking for. Fellow ophthalmologists and eye care professionals are also able to schedule professional office hours through the website. Further information about Palisades Laser Eye Center or Dr. Richard Gordon can be obtained by emailing the practice or calling 1-877-319-2020.